Mr. Robert “Bob” Horace Jones, 91, of Dunn died Friday morning at his residence. He was born in Hawkins County, TN, on November 26, 1926. He was preceded in death by a brother, James C. Jones and a sister, Elsie Jones. Bob was the son of the Reverend James Cecil Jones and Lucille Swann Jones. Being the son of a Baptist minister, he grew up in West Virginia and Tennessee. He attended Mars Hill College, graduated from Wake Forest College and Wake Forest Law School after having served in the U.S. Air Force as an aerial photographer during World War II. He was a trust officer with First Citizens Bank before practicing law with Morgan, Bryan, Jones, Johnson, Hunter & Green and later Bryan, Jones, Johnson & Snow. He retired practicing law with his son, Cecil "Bo" Jones at Jones & Jones Attorneys. He spent many years serving as the Harnett County School Board attorney and as corporate counsel for South River Electric Membership Corporation. He was a member of First Baptist Church of Dunn where he taught Sunday school and served as a deacon. 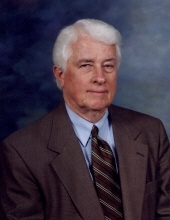 He served many years on the Dunn Parks & Recreation board. Bob volunteered as a coach and mentor for young men. He loved his family, his church and his country. Bob was very appreciative of his caregivers, Rene` Hardison, Ricky Claytor and trainer, Andrew Pope. A memorial service will be held Monday at 2 p.m. at the First Baptist Church by Dr. Len Keever. Bob is survived by his wife, Peggy T. Jones, three sons, Rob Jones and wife Lou Ann of Dunn, Bo Jones and wife Angela of Dunn, Jonathan Jones and wife Elizabeth of Little Washington, a sister, Betty Ann Manly and husband Don of Bradenton, FL, two sisters-in-law, Jan Jones and Barbara Bullock, nine grandchildren; Matthew Smith and wife Carolyn, Jessica, Lydia and Celia Jones, Caleigh, and Matthew Jones, Lelia Elise, Eliza Grace and Anna Evans Jones, two great grandchildren, Aaron and Landon, and his faithful dog, Lillie. The family will receive friends Monday from 1 to 1:50 p.m. at the First Baptist Church. The family has asked instead of flowers that memorials be made to the First Baptist Church, 309 West Broad St.
To send flowers or a remembrance gift to the family of Robert "Bob" Horace Jones, please visit our Tribute Store. "Email Address" would like to share the life celebration of Robert "Bob" Horace Jones. Click on the "link" to go to share a favorite memory or leave a condolence message for the family.